After I taught Tuesday morning, Chad and I headed to Plaza Elíptica, a stop on the metro's line 6, where we would catch a bus to Toledo. Seventy kilometers south of Madrid, Toledo was the capital of Visigothic Spain after the fall of the Roman Empire. The town is known as a place where Christian, Jewish, and Muslim cultures coexisted. I had visited Toledo once before, in February of 2010. Once inside the Plaza Elíptica bus station, there were purple signs (in Spanish) that clearly told you where to buy bus tickets to Toledo. The bus leaves every half hour. We got upstairs to the dársena at 13.31, only to find that the 13.30 bus had already left; we had to wait for the 2 o'clock bus (buses in Spain leave on time!). 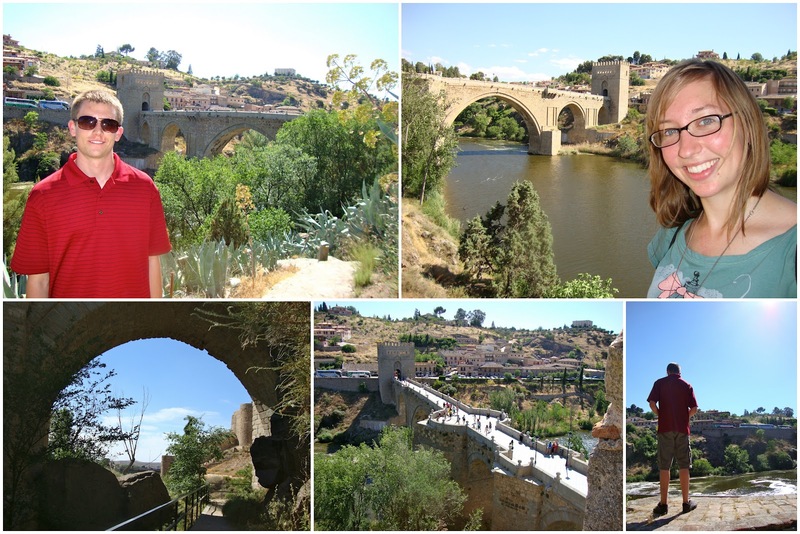 We walked the five minutes from the bus station to the city walls, entering Toledo around 15.00 in the entrance pictured below. Our first order of business was to find some lunch. We both had a menú del día in one of the first restaurants we saw. Chad had gezpacho and quail for his first and second plates. Walking around the city, we immediately noticed many of the thin streets were gorgeously decorated with cloths and lanterns hanging above. 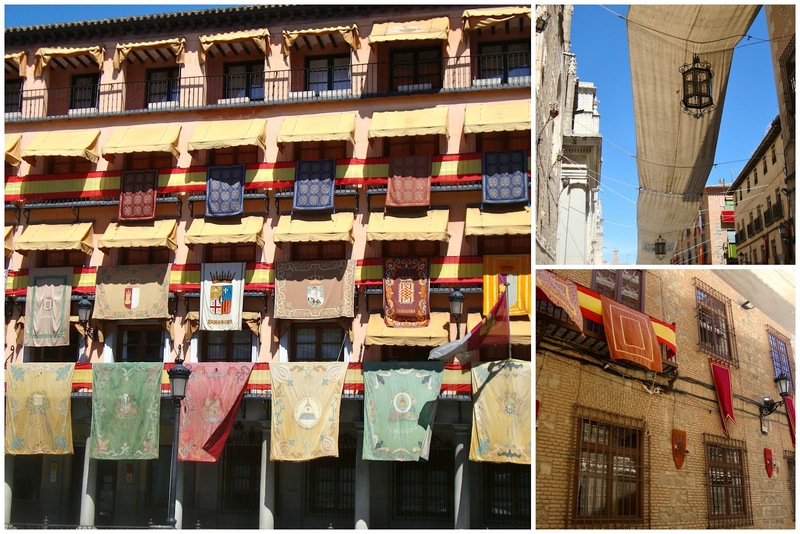 There were also colorful flags and banners in the plaza and throughout the town. 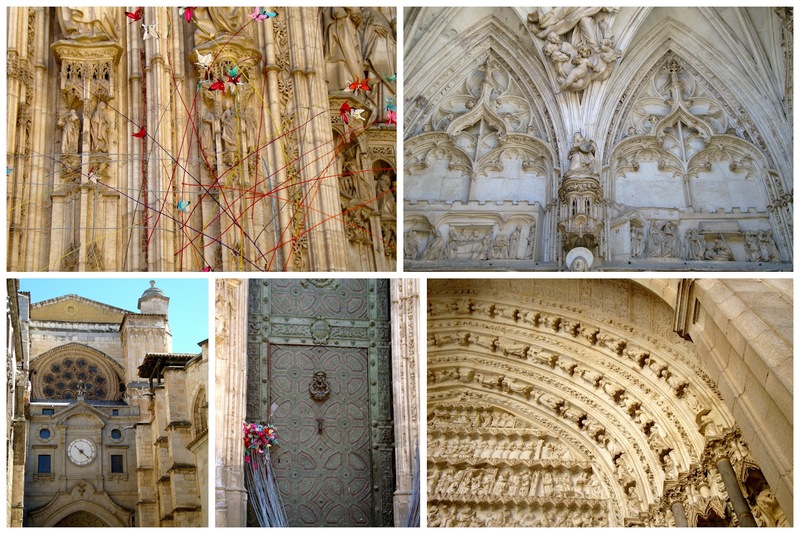 I asked a Spanish man what all of the decorations were for, and he said it was for Corpus Christi -- a Christian holiday taking place on Thursday. Once we had arrived at the plaza, we went to the Tourism Office (right there on the square) where we were given a free map and advice of where to visit. I would recommend doing the same if you're going to Toledo. Map in hand, we left the plaza with our new destination: the Cathedral. Instead of paying to visit the whole Cathedral, we entered on one of the sides (the side with the clock, as pictured in the bottom left). In this entrance you are restricted to a large, fenced in section of the Cathedral; but can still see lots. We saw these signs after walking past one side of the Cathedral. To see the iglesia (church), monasterio (monastery), and barrio judío (Jewish neighborhood), do you go straight or to the right? We made our way to the Saint Martin Bridge, where we walked down the hill and got close to the river. Smelling the water, watching the birds, and enjoying the plants was a pleasant addition to our afternoon in Toledo. After buying what may have been our best purchase of the day (a 2 liter bottle of ice cold water for 1 euro), we headed back to the main plaza to buy some mazapán. Toledo is well known for its mazapán, a Christmas dessert made mostly of sugar and almonds. Although it's out of season, Toledo's got mazapán in every gift shop all year round. We bought a variety case of mazapán in a mazapán shop in the plaza and consumed it all right there, splitting each one in half. 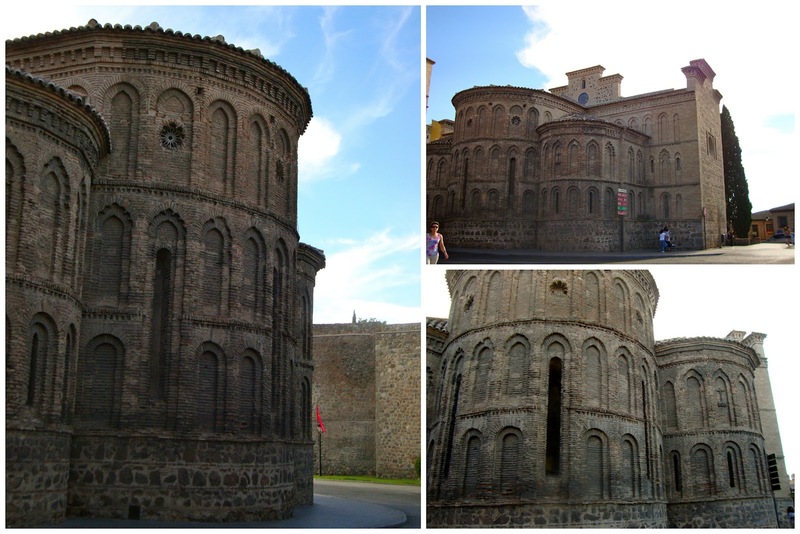 I think my favorite building in Toledo was the small church we saw upon entering and leaving the town, whose name escapes me now. Chad's got the map we got in Toledo; I can look for the church's name tomorrow. As we left Toledo that evening, I snapped one last picture of one of the walls surrounding the old capital. 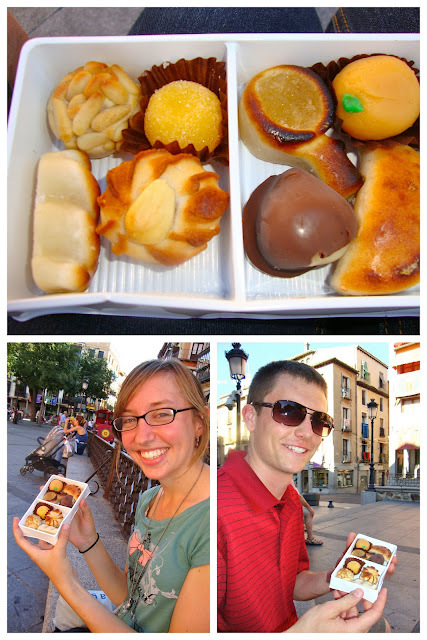 We walked back to the bus station and headed back to Madrid.